A funny story about seeing the world from a different viewpoint. This tale of differences and friendship could have been told with side by side panels of different views. But it’s cleverer than that. 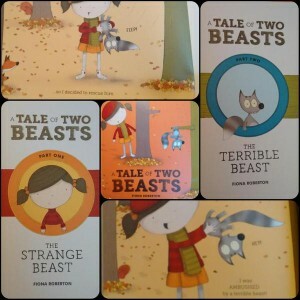 First we get the “strange beast” version, told from the little girl’s perspective, with its own title page. Then once the full tale has been told, we get a new title page and the “terrible beast” version of events. This is so effective. The seven “repeated” double spreads are similar by design, but the change in perspective makes repeated readings not only fun but necessary – finding similarities and differences is a great game. The story is cute and compelling, withstanding many repeat readings. Having a female main character in a neutral themed plot is a bonus, and with both genders as main characters, a pinch of ethnic diversity in the humans, and a cameo from Henry and Spot, this ticks a lot of boxes if you’re looking to tick any! The slightly wild ending also appeals to my Chaoticians, as does the strange beast’s dislike of bedtime!